Sky One was my best trade last month. Really money from the sky! 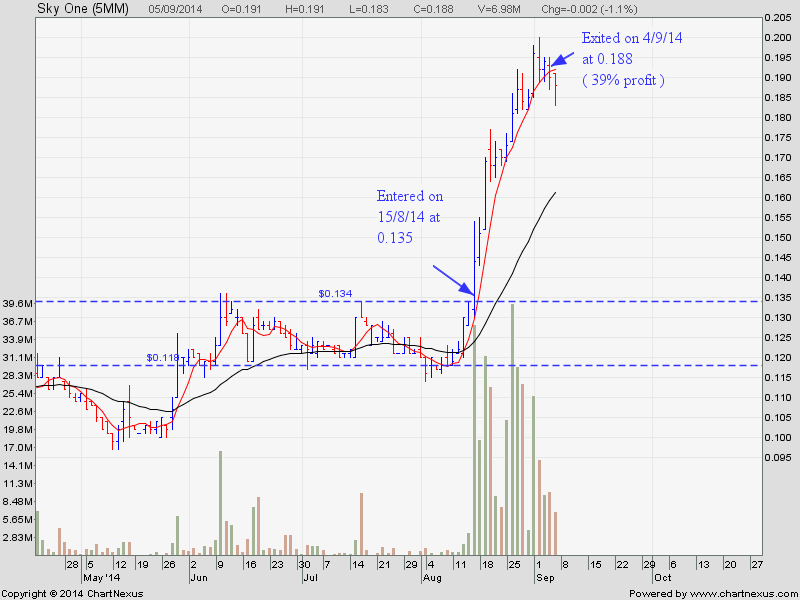 I posted this stock call here on 14/8/14 and my stop buy order was triggered on the very next day at $0.135. After I entered this stock on 15/8/14, there was no exit signal and everyday I shifted my stop loss till it was triggered on 4/9/14 and I am out at $0.188. Garnered a return of 39% for 3 week. The reason why many people have difficulty in trading or cannot ride the trend is not because they have weak psychological, bad money management skill or unpredictability of the stock market. It is because they don’t have a Good Trading System. A Good Trading System is the missing link to Successful Trading. With a good trading system, sometime you don’t even have a chance to cut loss. With a 90% accuracy stock trading system like mine, you will not have any psychological and money management issue. You will sleep well at night and have no problem cutting loss knowing that it will be covered by subsequent winning trades. Your job is really just see your trading account grow fatter and fatter each month. You will make the market pay for all your expenses, your next holiday, your next house, your pension fund, etc.